Around 1000 men and women will be ordained into the Church of England this summer to minister in communities across the country and to mark the occasion the CofE has published new video and audio faith stories. The new to be Ministers come from a wide range of backgrounds and include a former professional wrestler and a steam engine driver. One prison chaplain in Southwark will be ordained in prison, in what's believed to be the first service of its kind. 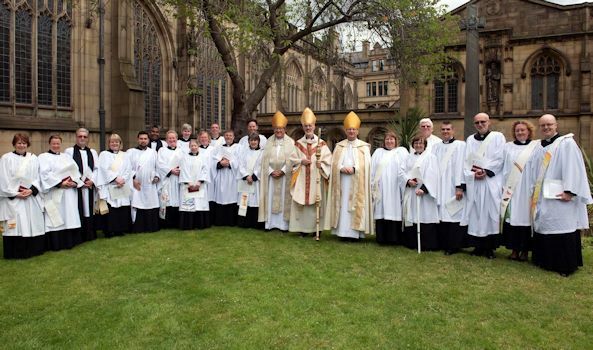 Craig Henderson will be ordained a deacon in the Diocese of West Yorkshire and the Dales and will be working in Barnsley. He was in the army for six years and then trained as a professional wrestler. He talks about his time at a vocations day for people exploring ordination: "I thought 'why would God call me?' then there was a video explaining that Jesus calls people who are flawed, he doesn't call the perfect. I went away from the day thinking I need to have a bit more faith in myself and in what God's calling me to do. The moment when it all happened was like a light bulb going on. I'd had these feelings for a while and not really known what to do with them and suddenly everything starts to slot into place like a jigsaw." Dianne Gamble from York worked at the National Railway Museum for 18 years and qualified 18 months ago as an engine driver. She says: "I've always been able to see the links between steam locomotives and the spirituality of God. You see power that can move something big and that mystery of God that is with us all the time and the capacity of God to move us in life and make a difference." Denis Hartley will be ordained a priest in HMP Thameside where he works. He says it was the obvious choice to have the service there: "I don't think it would have happened without the input of the prisoners. They are a great bunch to be with. They can be very challenging, but it's very rewarding. I think there's that element of being where God wants you to be and doing what God wants you to do and I don't think that would have happened outside." Following the success of last year's #newrevs hashtag those being ordained (ordinands) their friends, family, congregations and clergy are being encouraged to take to twitter again to celebrate the ordinations. As part of the ordination service, the new priests and deacons are addressed by a Bishop of the diocese in which they will serve who will say: "They are to proclaim the gospel in word and deed, as agents of God's purposes of love. They are to serve the community in which they are set, bringing to the Church the needs and hopes of all the people. They are to work with their fellow members in searching out the poor and weak, the sick and lonely and those who are oppressed and powerless, reaching into the forgotten corners of the world, that the love of God may be made visible."